Dieting? Trust us, the best beverage for your calorie budget is water. Liquid calories simply aren't worth your while, because they do nothing to fill you up -- the ultimate example of "empty calories". For example, an eight-ounce glass of apple juice is 114 calories, and it takes at least four apples, at 95 calories each, to extract that much liquid. If you like the taste of apples, you're much better off eating the fruit. Can't imagine breakfast without orange juice? Just four ounces is 60 calories, about the same as eating an orange. But unless it's fresh-squeezed, the juice also could contain additives and preservatives, and four ounces won't be enough to last you through your whole meal. The orange, though, will last longer and offer more taste satisfaction. 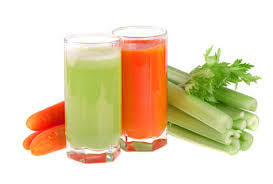 The one exception to the juice rule is vegetable juice: It may actually help you lose weight, according to a study at Baylor College of Medicine. When researchers put 81 overweight people on a diet rich in fruits, vegetables, whole grains, and lean meats -- the same foods found in 7 Years Younger Anti-Aging Breakthrough Diet -- they found that those who drank an eight-ounce glass of low-sodium vegetable juice every day for three months lost on average three more pounds than those following the same diet without the juice. They theorized that the juice filled people up so they ate less overall. This kind of juice is so low in calories that it can fit quite easily into a diet plan without tipping the calorie scale. Eight ounces of low-sodium vegetable juice contain only 51 calories; the same amount of low-sodium tomato juice is 41 calories. Either one also counts for two servings of vegetables. Try sipping a glass while you're making dinner to help prevent pre-meal noshing and to boost your vegetable intake for the day. Could Eating More Fat Help Flatten Your Stomach?